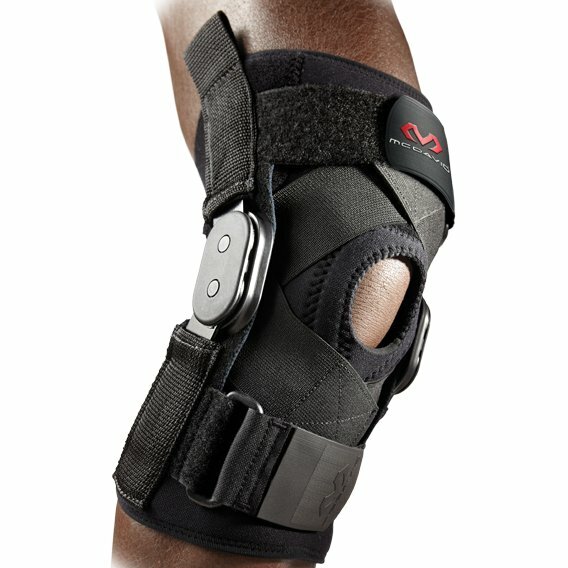 LIMITED QUANTITIES/SIZES STILL AVAILABLE McDavid Hyperextension Deluxe Hinged Knee Brace relieves pressure on the patella while the four crossing straps in the front provide additional support and help improve the compression/fit received from using the brace. 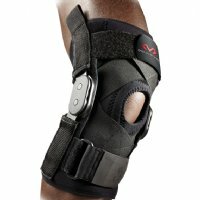 Deluxe Hinged Knee Brace for Hyperextension by McDavid 4-way adjustable hyperextension stops to help control range of motion. Elastic cross straps provides support in rehabilitation. 3/16" thick, 100% latex free neoprene offers heat therapy to the knee. 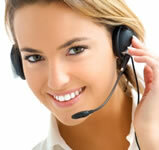 Padded buttress relieves pressure from patella. Velcro straps are adjustable. 0-15-30-45 degree stops.